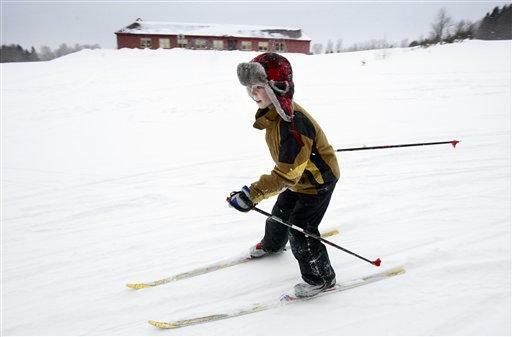 STOCKHOLM, Maine (AP) - Suzy Anderson recalls the days when everyone skied in Aroostook County. She and her friends skied to school. They wore their ski boots in class, and skied after school. They competed in winter carnivals and raced each other on weekends. Then Anderson left northern Maine to go to college. When she returned in 1974, the skis had disappeared. They'd been replaced by gas-powered snowmobiles. "None of the kids were skiing. There was no skiing whatsoever. It was because of the snowmobiles," Anderson recalled. "Skiing was essentially over." These days, kids are back on skis, thanks to a $25 million effort over the past 12 years to restore the cross-country skiing tradition in Maine's northernmost county, a rural expanse of rolling hills, wilderness and potato farms that's bigger than Connecticut and Rhode Island combined. Unlike downhill skiing, cross-country skiing involves zooming across the countryside on longer, skinnier skis, providing an exceptional aerobic workout. The Maine Winter Sports Center, backed by a charitable trust in Portland, has provided rental skis, equipment and expertise to communities, and has built a pair of world-class biathlon venues dedicated to the Olympic sport that combines cross-country skiing and rifle marksmanship. A pair of World Cup biathlon events, one last weekend in Presque Isle and another this weekend in Fort Kent, highlight the center's success and inspire local kids, who are excited about getting outdoors and engaged in a healthy activity in the state with New England's highest obesity rates. Many dream of competing beyond Aroostook County. "I pretty much can't live without skiing," said Ashley Richards, a sophomore skier at Caribou High School, which last year won the state cross-country championship, before skiing off from a state-of-the-art ski building and onto a 7-kilometer (4.3 miles) system of trails, all created in the last 10 years. Maine's skiing tradition began in the untamed woods of northern Maine after the Civil War, after Maine looked to Sweden to find hardy souls to settle Aroostook County. In 1870, the first Swedes arrived, settling the town of New Sweden. Several towns, including Stockholm, followed. The roads they built became impassable in winter in a region that averages 115 inches of snow. So the Swedes skied for transportation, for hunting, and for fun, just like they did back home. "Everybody skied at the time because the roads were closed. It was the only way to get around," said Ralph Ostland, 87, of New Sweden, who recalls skiing's heyday in the 1930s, when the New Sweden Athletic Club was formed, and when the hardiest skiers participated in a legendary 180-mile race from Bangor to Caribou. The winter sports tradition held in the sparsely populated region for a century, even after mechanized equipment opened up the snow-covered roads around World War II. Its fall coincided with the arrival of snowmobiles, powerful and seductive, followed by other modern conveniences that lured kids indoors: television, video games and computers. Over time, snowmobiling evolved into a massive economic engine in Maine, which has 14,000 miles of groomed snowmobile trails that draw visitors from all over New England. But until the arrival of the Libra Foundation, the charitable trust set up by the late Elizabeth Noyce, ex-wife of an Intel Corp. founder, there were few groomed skiing trails. Funded by Libra Foundation, the Maine Winter Sports Center fulfilled the vision of Andy Shepard and Max Cobb, with a mission statement of "Creating a model for the sustainability of rural communities through a skiing lifestyle." Anderson, co-owner of the general store in Stockholm, credits the Maine Winter Sports Center and Libra Foundation for rescuing Aroostook after the closing of Loring Air Force Base in 1994. The Maine Winter Sports Center built a biathlon lodge and stadium called the 10th Mountain Center in Fort Kent in 1999, and provided snow-grooming equipment to ski clubs and expertise in laying out trails. It began a rental program to give parents a low-cost alternative to buying skis for their kids. Soon there was a second skiing venue, the Nordic Heritage Center, in Presque Isle. "You get kids going early and it just becomes part of how they move," said Michael Smith, director of healthy hometowns for the Maine Winter Sports Center in Caribou. On a recent 15-degree day, more than a dozen miles from Smith's office, third- and fourth-graders at the New Sweden Consolidated School grabbed skis from a rack and headed outside for PE class. First- and second-graders, part of an after-school program, joined them on skis. The youngsters raced along a groomed trail that looped behind the playground, all smiles even when they took an occasional spill. Typically there's hooting, hollering and horseplay, and sometimes they engage in a game similar to tag. Teachers make sure they're having fun. "They seem to have more energy, more focus as far as learning, if they have the opportunity to be active," added Ernie Easter, who coaches the middle school ski team. The school provides cross-country skis for use at school for grades 3-6 and offers rental skis, at $55 for the season, for other children. Everyone has access, regardless of ability to pay. Other communities are building programs. At Caribou High School, the cross-country ski team no longer has to load up on a bus to go skiing because new trails have been built right behind the soccer field. The trails are lighted and groomed, thanks to donors, and there's snowmaking equipment for those rare occasions when Mother Nature lets the skiers down. There's even a ski building, with ski lockers, changing rooms, and bathrooms, funded by private donors, said Curtis Richards, vice president of the ski club. The whole idea, Richards said, was to eliminate any barriers that prevent kids from getting outdoors. "If you want kids to be in activities, you've got to make it so easy that they can't say no," Richards said. "The ones who try - they usually stick with it." A number of local skiers are moving up the competitive ranks. Russell Currier, a skier from Stockholm who aims to join the World Cup circuit, recalls the day Winter Sports Center representatives arrived at his school. They brought with them some skis for the kids to try. Currier was happy to get out of class for a couple of hours. These days, the 23-year-old is Aroostook County's best hope for Olympic biathlon gold. He's currently one step away from the top skiers at the World Cup level. But Currier said people don't have to aspire to be an elite athlete to get out on skis. Cross-country skiing is low-impact aerobic exercise and a sport that people can continue for a lifetime. The idea is to develop a healthy lifestyle and to fight childhood obesity. "That's one of the messages we're trying to get out. It doesn't have to be a competitive environment. It doesn't have to be all or nothing," Currier said.